All Aboard! 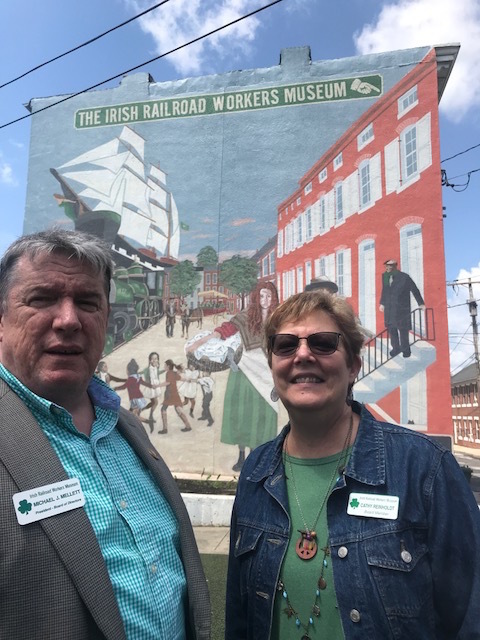 Michael Mellett and Cathy Reinholdt of the Irish Railroad Workers Museum in Baltimore in front of a period mural by Irish American artist Patrick Harnett who included an African-American drayman, a profession in which many Free Blacks laboured. 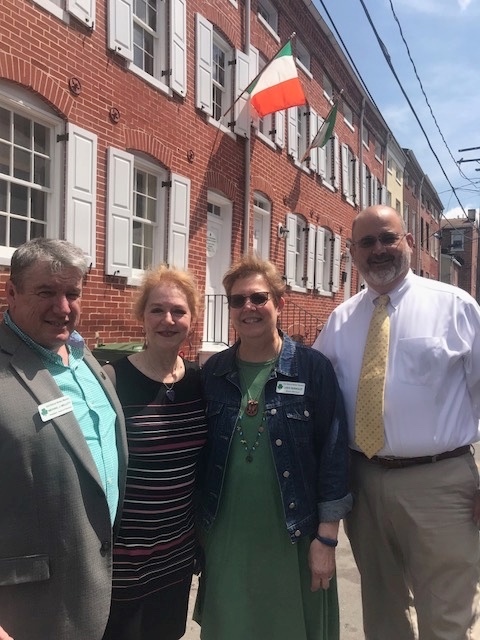 It’s probably an urban myth that Baltimore comes from the Irish, Baile an Tí Mhóir, or perhaps I only think that because it caused some surprise when I dropped that nugget of information before my gracious hosts from the Irish Railroad Workers Museum in that great city last Sunday. Whatever the truth, it’s a fact that Baltimore boasts a proud Irish heritage and an active cadre of community champions moulding that history to meet contemporary challenges. And while the Irish Railroad Workers Museum is indeed the pride and joy of the Baltimore Irish it also represents a project of national importance for Irish America and Ireland. Indeed, in telling the story of the Feeley family who arrived in Baltimore fleeing hunger and oppression in the bleak year of 1849, it is also telling an immigrant tale which resonates in America 2018. The restored alley-street homes housing this treasure represent the only 19th Century, urban, original, working class house museum in the US. The commitment and passion of the Irish Railroad Workers Museum committee is legend. They have brought back to life the story of James and Sarah Feeley — who still have descendants in the region — and been true in their telling to the oft-cruel realities of their era. Slave pens were located just a few blocks from the Feeley home while free blacks lived just doors away. The harsh reality of gun crime came home to Michael and his wife Kathy Kelly, a Museum docent, when 19-year-old John Brown , who grew up just down the block from the Museum was shot dead close to their home in April. “It was really tragic to see a kid we knew growing up, who we would have thrown a ball to and seen pop in and out of the museum, lose his live in such a pointless way,” says Michael. 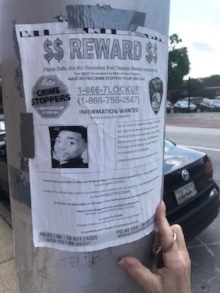 A police poster taped to a lamppost outside the couple’s home stands as eulogy for the dead teenager and a searing commentary on the cheapness of life in inner-city America. Yet there is reason for hope. New University of Maryland buildings have sprung up in the ‘hood and the Irish Railway Workers Museum is bringing visitors to a part of the city usually well-off the tourist track – even though it’s no more than a mile from the glittering Baltimore harbour. As, indeed should Michael and his colleagues who are serving in the best traditions of the Irish: preserving and promoting their own heritage while leading change in the heart of a community often enduring the same type of rejection which faced the Feeleys. Michael Mellett, Kathy Kelly, Kathleen Reinhold and Don Waters Jr. outside The Shrine and Irish Railroad Workers Museum. I had taken the scenic route to Baltimore — via Philadelphia where I was addressing the inaugural Irish Small Business-Big Impact 50 awards at the Union League on 18 May alongside Philly Mayor Jim Kenney (who had as it happens quite a lot to say on the subject of immigration). 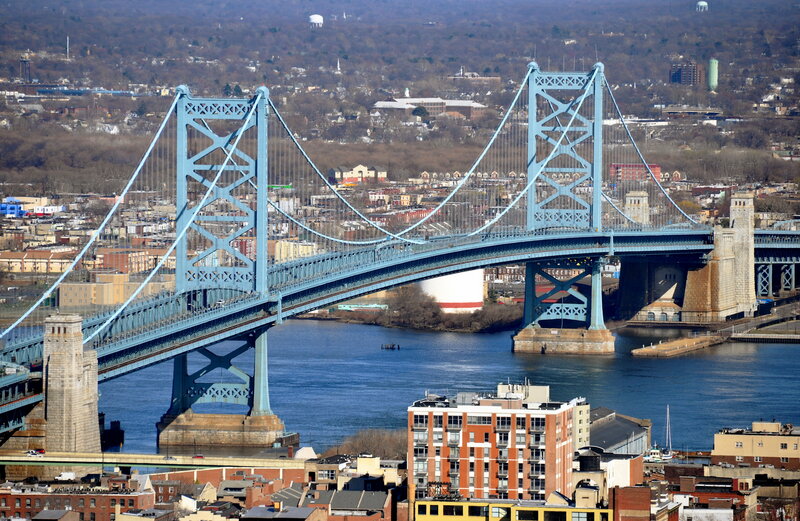 Irish American Business Chamber and Network Chairman Emeritus Bill McLaughlin had pioneered this Irish Echo-Philadelphia partnership which almost came unstuck on the Benjamin Franklin Bridge linking New Jersey and Pennsylvania. For, on approaching the bridge, I hit a pothole which blew a front tyre on my rental car. A wiser driver would have stopped immediately but I took my chances by attempting a Flintstone-style bumpy ride on three wheels over the busiest bridge into the City of Brotherly Love. If you were one of the thousand cars behind me on that 5 MPH trek across the Benny-Frank, my sincere apologies! 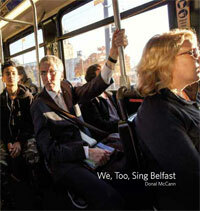 Date for your diaries for all those who love New York and Belfast: The ninth annual New York-New Belfast Conference is scheduled for the Big Apple on 7-8 June. New York City Council’s recently-elected Irish American Speaker Corey Johnson will join a high-powered roster of speakers at an event which builds bridges of mutual benefit between these two great cities. Details are online.